The dwarf Brass Buckle Ilex is a dwarf Japanese holly plant with a beautiful evergreen foliage and an excellent boxwood alternative shrub. It has glossy, burn-resistant leaves that vary in color between light green and yellow and give it a unique appearance that is a beauty to behold all year round. It only grows to about a foot in height, making it perfect for edging walks or bordering any area in your yard or garden. In milder climates, it can be used as a container plant too. This evergreen holly is easy to maintain because pruning is not necessary. However, if you want to shape it, the best time to do that would be in late winter. It is an ideal shrub for hardiness zones 6-8 and prefers acidic soils with good drainage, and a generous layer of mulch. Also, this adorable little shrub is salt tolerant and does well in container gardens. 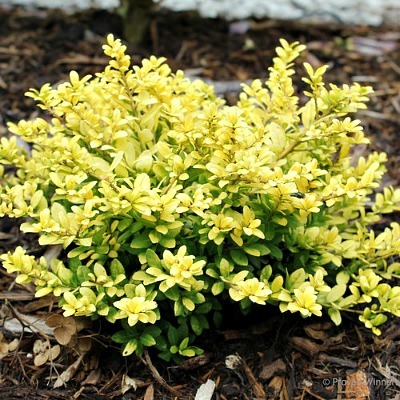 The fresh golden shade of the brass buckle ilex is much nicer than that of other dwarf holly shrubs making this a must have if you want a garden or yard that remains alive and beautiful all year long. Brass Buckle Ilex is grown in quart size containers. Orders shipping to AZ or CA may be bare rooted for shipping.